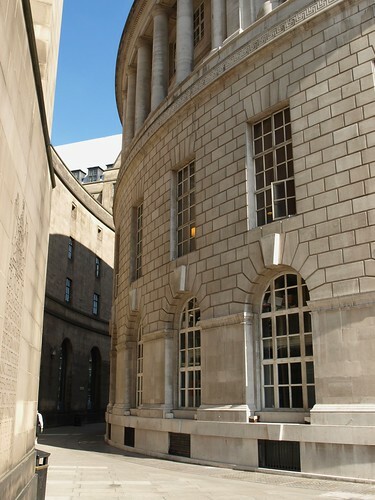 A Facebook group has been formed to organize opposition to the new proposals for Vincent Harris’s Library Walk in Manchester. Continuity in Architecture have been a-twitter with excitement at the prospect of a lecture by the highly acclaimed architect Peter Wilson. The sense of expectation was heightened by the memories of past and highly influential talks which probably date back to the 1980s. Concepts of interpretation, context, place, narrative and storytelling are always a marvellous encouragement. Peter Wilson did indeed deliver an inspirational lecture at CUBE. Using the illustrations from his new book about drawing as the basis for the talk, he skipped through a chronological dissection of the work of Bolles + Wilson. He is a man obsessed with hand drawing, and to prove this he showed the preliminary drawings for each project before describing how these sketches influenced the final building. “If the initial sketch is not correct”, he explained, “then the finished building will not be right.” Wilson considers architecture to be “something that accompanies daily life” and his talk and the sketchbooks gloriously showed that. Continuity in Architecture is very pleased that one of their final year students has been awarded the University of Manchester award for Outstanding Academic Achievement. This prize recognises the truly exceptional performance of a graduate student. Tom Cookson, who has just completed his sixth year, designed a collection of small structures within an intimate area of the city of Dubrovnik. This exactingly designed Repository for Unwanted Memorabilia attaches itself closely to the grain of the city. It integrates a series of interconnected spaces with the three-dimensional character of the dense urban environment. The project was beautifully communicated; Tom used both computer and hand drawings to describe his vision. Tom, who has recently been asked to interview by a number of architectural practices including the with the 2011 RIBA Royal Gold Medal winner, David Chipperfield, also won the Manchester School of Architecture Student of the Year award. A flying visit to St Wilfrid’s RC Church in Hulme, Manchester designed by A.W.N. Pugin. Pevsner writes: By Pugin, 1842, and memorable as a very early case of the archeologically convincing church … The exterior of the church is red brick, with lancet windows. It all had to be done cheaply – Pugin’s bane. But he allowed himself the touch of archeological fun of laying his bricks English bond, not Flemish like the hated Georgians. The church was subsumed in the redevelopment of the 1970s and lost its relationship with low-rise terraced streets. The New Hulme has reinstated something of the original scale of the surrounding buildings. The building was deconsecrated in the early ‘nineties and converted for use as workshop and business start-up units. The nave has been filled with a utilitarian free-standing structure – in theory the insertion can be removed and the single axial space would be revealed. The chancel and high-altar house a cafe. Millions have been spent on the adjacent award-winning park and bridges but the exterior of this pre-existing monument continues to deteriorate and repair is probably beyond the resources of the present occupiers. English Heritage inspectors continue to visit the Grade ll-listed building and are, in general, pleased that the building is heated and used. The Degree Shows at Manchester Metropolitan University open on Friday 18th June at 5pm. CiA Studio’s Bachelor of Architecture Projects can be found in Rooms 502 and 503 on the fifth floor of the Chatham Building, Cavendish Street, M15 6BR. We’re very pleased with the quality and variety of work this year and we hope visitors will be delighted by the physical models, pencil drawings, sketchbooks and good old-fashioned CGI on view. Teaching staff, including Studio Director Sally Stone, will be at the Show tomorrow evening from 6pm if you would like to talk about the work or perhaps discuss joining the Studio in the next academic year. Elm Street, Middleton, M24 2EG. Architectural Tour at 2pm by David Morris, Historic Building Specialist. Booking not necessary. At the Bandstand in Jubilee Park. In conjunction with Friends of Jubilee Park and Middleton Band. Free entry. Edgar Wood’s beautiful building, LONG STREET METHODIST CHURCH will be open to visitors: Friday 10th and Saturday 11th: 10am to 4pm and Sunday 12th: 12.30 – 4pm. Guided walks to some of Edgar Wood’s other buildings at 2pm on each day. Exhibition. Daily: Middleton Arena. M24 1AG. Free entry. Workshop participants will explore a narrative approach to understanding cities, taking Manchester as their object. They will explore how the past and the present combine and/or clash in the streets, paths, blocks and spaces of the urban environment. They will bring creativity and strongly reflexive approaches to questions of for who, and by whom, cities are designed. Participants will predominantly use film-making as their medium, but may also use montage, modelling, drawing and redrawing as methods of interpreting and designing cities – with attention to urban form, contextual relationships, social relationships, sensory experience, activities and movement. The three-week workshop, which begins on Thursday 22nd April, will include a series of film-making exercises, editing instruction, seminar discussions, film showings and a one-day colloquium to discuss results. The films produced during the workshop will be shown at the CUBE Gallery at 6pm on Thursday 13th May and an exhibition of the work will be staged at the Contact Theatre during the Future Everything conference, 13th-14th May. The workshop is open to students in all departments of Manchester Metropolitan University and the University of Manchester and will be of particular interest to those studying in Faculties of Art & Design, Planning and Architecture. Any interested parties from outside the Universities should contact Sally Stone at the email address below. Maximum of 15 places on each tour. The job description mentions outstanding management and interpersonal skills and successful leadership particularly related to the management of change. A Professorship is available for an appropriately qualified candidate. How will the new library wear the inevitable black shroud? As the vultures gather around the soon to be vacated carcass of E. Vincent Harris’s Central Library in Manchester, CiA student Michael Groves has discovered the above stygian description of the then new library’s 1934 context by an anonymous but poetic critic. Manchester Town Hall appears uncredited in the new film, playing the Houses of Parliament. Under this very ceiling Holmes struggles with Moriarty. Continuity in Architecture will never mistake Waterhouse for Barry even if they can believe Robert Downey Jr and Jude Law are Holmes and Watson.